On my desk as I write this is a mug of Peet’s Costa Rican coffee, ground in my kitchen, brewed strong, and drunk black. The beans arrive via UPS within days of roasting. Peet’s has been my house coffee since I was a Cal Berkeley undergrad. I remember seeing Alfred Peet wearing his shop coat behind the counter at the original store on Vine and Walnut. So, in the interests of full disclosure: yes, I’m a proud Peetnik. Peetniks are all about the coffee: the beans, the roast, the brewing. Like Alfred Peet himself, they disdain what they regard as the coffee-flavored milk drinks served by Starbucks. 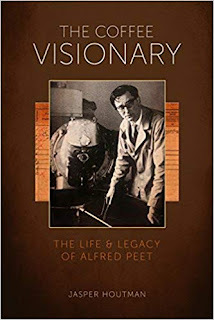 Despite my lifelong commitment to the brand, it turns out there was a lot I didn’t know about Alfred Peet. That’s been remedied by Jasper Houtman’s excellent new biography, which covers Peet’s personal life as well as the history of the company. Houtman bases his account on published and unpublished interviews with Peet, as well as first-hand interviews with many people who knew the man personally. Born in Holland in 1920, Peet was raised by a stiff, demanding father with whom he never established a warm relationship. Years later, when he traveled and lived around the world, he wrote only to his mother, never to his father. This alienation wasn’t entirely his father’s fault. Young Alfred was a rebellious child: he didn’t do well at school because he felt pressured to perform, and he chafed at the tight confines of bourgeois Dutch culture. Peet’s father and various in-laws were in the coffee business in Holland. Alfred had a natural flair for tasting coffee and tea, but rather than join his father’s company, he left Holland as soon as he could. After WWII went to London to work in tea for the Lipton company. Soon he left for the Dutch East Indies (today’s Indonesia), and after that for New Zealand. Seeking a still bigger horizon, he came to the United States in 1955, landing in San Francisco. A series of short-term jobs—including door-to-door salesman—followed, which the shy Peet found excruciating. But he was determined to make his way. At the time, most coffee came pre-ground in cans from the grocery store. But having discovered the Italian espresso culture of North Beach, Peet realized there was an opportunity in America for better coffee. He was determined to make it happen. Unlike the Bay Area innovators of recent years, Peet was no young upstart. He didn’t open his first store until 1966, when he was forty-six years old. His timing and choice of location couldn’t have been better: the store on the corner of Vine and Walnut became a founding feature of Berkeley’s Gourmet Ghetto. The area’s reputation was cemented when Alice Waters opened Chez Panisse around the block in 1971. From the beginning, Peet’s mission was to teach people about coffee. In doing so he didn’t pull any punches. He railed against customers who brewed his coffee in percolators. He fired employees who didn’t follow his strict procedures. And yet he freely shared his knowledge with people who wanted to learn about coffee. He trained many coffee roasters who went on to build their own businesses (such as Starbucks). Despite his Dutch directness—which Americans often read as rudeness—and his inflexibility about the correct ways to do coffee, many of those he trained came to fondly regard him as a mentor. Like most entrepreneurs, Peet assumed total control of all details of the operation. Part of this was intellectual—the man was a perfectionist who insisted on doing it the best way, or not at all. Another part of it was characterological: scattered throughout Houtman’s book are examples of obsessive-compulsive behavior, as well as a compromised approach to interpersonal relationships. These traits enabled him to create a brand known for its commitment to quality, but also limited its potential to expand. Peet was entirely comfortable with this outcome: he had a small but profitable company that met his personal standards. Later in life, he acknowledged some downsides: he had missed out on some trends and opportunities, and suffered from the stress that went with total control. Alfred Peet’s emphasis was on practical hands-on training. He felt cupping and roasting can be learned, but not from textbooks. Remarkably, he did not consider coffee to be the ultimate sensory challenge. For him, that was tea. Peet had little use for pompous, wine-like descriptions of coffee. He encouraged people to use simple, even personal terms to describe coffee flavor. His emphasis, especially when teaching someone how to roast beans, was on direct experience, on doing rather than knowing. This could lead to some unusual, almost Zen-like, directives. How do you determine the moment when you have to take the beans out of the roaster? “The coffee will speak to you and will let you know when she’s ready,” Alfred told his students. For outsiders this sounds mystifying, but those who wanted to learn the profession from him developed an ear for it as well. Peet didn’t invent a technology. He didn’t build a commercial empire or create a new way of doing business. Instead, he was a sensory entrepreneur: a blender of beans and an evangelist for flavor. Alfred Peet has become known as the father of the American coffee renaissance. The impact of his life and work are evident wherever one goes. Today, there is quality coffee and espresso in crossroad burgs and small towns throughout the country’s vast interior. For that, Mr. Peet, we thank you.